"Apna sapna ... Money , Money", "Money hain toh Honey hain", our dreams, our thoughts reflect in Bollywood movies. Money is on our mind all the while but how to earn it fast ... Faster ... FASTEST ... Legally and Securely?. Our India is emerging as a Super-Power. Gone are the days when investing in Gold, Bank Deposits, House etc. were considered Best and Safe. In the Digital Age, it's necessary to invest smartly to gain maximum returns in a short period of time. India's real GDP growth rate is amongst the fastest in the world. We must align our personal progress with national development and boost Indian economy. Yes, you guessed it right, I am referring to TRADING. Trading is the Smartest means of Investment to gain Maximum returns, if it's done studiously by understanding market scenario at the given time. What if we have the #BestTradingApp, which will provide us all relevant information about - What's happening in the market, "Market mein kya chal raha hai". Edelweiss Mobile Trader aka #EMT app is the highest rated trading app on Android & IOS in India. 1. Speed, Stability and Simplicity are the basic principles of this app. 2. We can customize the watch list to monitor our favourite stocks, track investments and live PnL across asset classes with detailed reporting. 3. One step simplified login. 4. Pull the Bull : Access from anywhere in the app to view live information about Nifty ,Sensex, USDINR along with SGX Nifty. 5. Three taps to complete an order on the app. 6. Exclusive Stock recommendations along with detailed report from the Edelweiss research team. 7. It's absolutely FREE to use and No nuisance of advertisements. Constructive and well meaning feedback helps create a holistic experience for the app users. #EMT gets 700 feedback mails/SMSes from users daily and all this feedback is reviewed daily. User inputs are most important. Major part of the development and enhancements in the #EMT app are outcomes of user feedback. Trading is no longer a men-domain. According to a recent study women are fast emerging a major force in this arena. Few years ago only my father was interested in Trading, but recently my sister has started Trading and discussing market with father. @i_RahulJain, Head of Personal Wealth Advisory, addressed us about the #IndiasGrowthStory, future of Indian Equity Market and more. On this unique and progressive background , Edelweiss.in arranged a Finance &; Technology bloggers meet on 3rd April 2018. 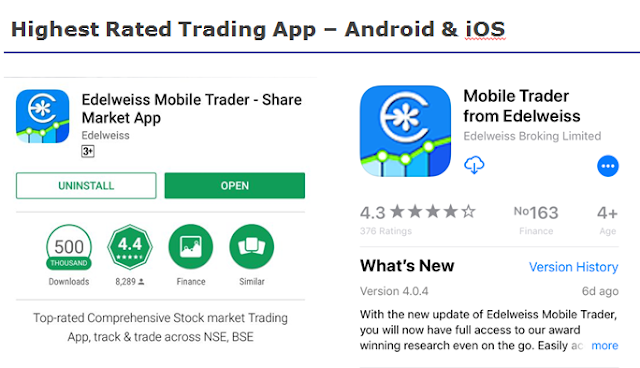 We got the first hand opportunity to understand the key features of the #Edelweiss Mobile Trader - the #BestTradingApp which has gained India's highest rated 4.4 Google app rating. We learnt numerous nuances of #EMT through Demo of app, Presentation and Q&A session. #EdelweissMobileTrader is a new-age, Super Speedy, simple to use, Stable , Equity & Commodity mobile trading app for Android and iOS. It empowers us to track and trade across Equity, Equity Derivatives, Commodity, Currency Derivatives, NCDs, Bonds, Debt and e-SIP across NSE, BSE, MCX and NCDEX. #EMT app is awarded for the 'Best use of Mobile technology in Financial Services' by ET NOW BFSI Awards. 'Best use of Mobile technology in financial services' by ABP News BFSI Awards. Thanks for giving this information. It's very useful for me. Share market courses in Mumbai. 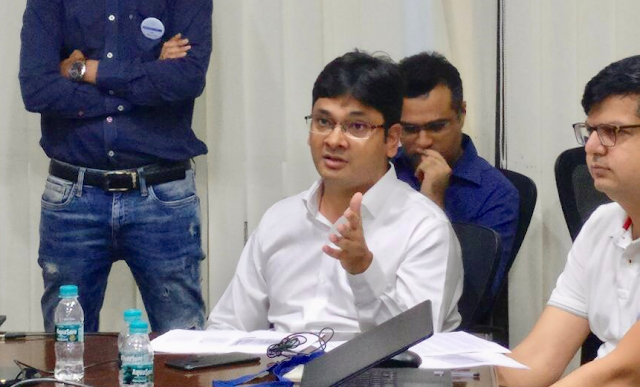 Share market training in Mumbai.